July is always an exciting month and it’s a busy time all around the world with countless festivals that will please your cultural side as well as your artistic, music, and adventurous sides. Here are July’s top 10 festivals around the world to tickle every side you have. With an all-star line-up that includes Arctic Monkeys, Blur, Editors, Kings of Leon, Queens of the Stone Age and Rhianna, you won’t be short of entertainment options at this festival. If all that music gets a bit too much, you can always head over to the fashion, design and art tents for a quieter appreciation of the arts. Not that you ever needed a reason to visit Poland but we think this is a pretty good excuse! With another epic line-up, Benicassim is set to continue its reputation as the best festival in Spain. Headliners this year include Queens of the Stone Age, Beady Eye, Arctic Monkeys, The Killers, Rudimental, Dizzee Rascal, Jake Bugg and Kaiser Chiefs. The festival is set near the beach so when all that dancing gets too much you can always pop to the sand for a snooze. In the chilled out town of Byron Bay in Australia you’ll find an environmentally friendly festival with a stong emphasis on environmental issues and protecting our world. There’s a hippy vibe for the whole family with activities to keep the little ones entertained while the big ones sway along to the likes of Mumford and Sons, Empire of the Sun and Babyshambles. Bring your wellies, your poncho and artistically arrange some flowers in your hair to really fit in. This independent festival brings you the best in new and emerging music from all over the world. With a focus on local businesses, Pitchfork has a real arty and community feel. You can rock out to all the new music and bands at the festival and between sets there is plenty to keep you entertained. Shop for old records at the Chirp Records Fair or take a look at the local art, handmade jewellery and unique goods on offer. You could also spend hours getting lost in The Book Fort where you will find an intimate program of readings and panels. If you thought it wasn’t possible for Marrakesh to be even more packed with entertainers, artists, street vendors, snake charmers, fortune tellers and visitors from all over the world then you need to experience the Marrakesh Popular Arts Festival. With a perfect mixture between ancient traditions like folkdances and Berber musicians and modern entertainment, you’ll be sure to experience a sensory extravaganza. Yes, that’s right, this is the world body painting championship where incredible painters come together to create fabulous artistic creations. This is like a turbo charged face painting party for adults. This year will be the 16th year that the colourful festival takes place in the stunning town of Portschach. Most women would like to be whisked off their feet by their hubby from time to time but we think this might be taking the dream a step further. Macho men prove their strength and fitness in the Wife Carrying World Championships as they make their way around the course...all while carrying their wife. We like to see that the race isn’t taken too seriously as prizes are awarded to the most fun couple and the best dressed couple. If you’re looking to get your adrenaline levels surging in Spain then a run with the bulls is sure to do the trick. The Pamplona Running of the Bulls is a controversial part of the San Fermin Festival and sees the streets sectioned off in preparation for the release of a small group of bulls. The tradition began in the 14th century and was simply a way to transport the bulls to the market. Young men were soon racing with the bulls and the competition to run with them began. 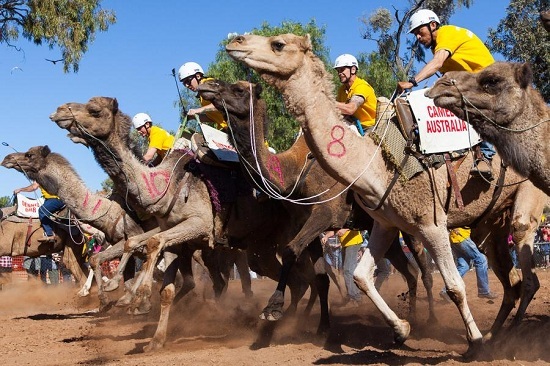 If you’re looking for a different kind of festival in July then the Camel Cup in Australia might be the event for you. This is a family friendly event where the contestants will have just as much fun as the cheering crowds as lumber towards the finish line. For those who prefer the predictability of wheels there are also rickshaw races which promise to be a barrel of laughs. Dubbed as ‘A four-day party like no other...’ The Secret Garden Party is one of the UK’s worst kept secrets when it comes to British festivals. Set in the grounds of a Georgian farm house, this huge party is a magical place where the boundaries between childhood and adulthood collide. You can leave reality at home and have a rummage through your fancy dress box because the crazier the outfit, the better. And don’t forget there’s a great musical line-up too but the likes of 2manyDJs, Faithless, Bastille and 8 Foot Felix.